I’ve got a smidge of a problem with my freezer. You see, I put things in but they never come out. That is, until they fall on my head as I’m trying to shove something else in there. But after being assaulted by an almost year-old bag of frozen rhubarb, I decided it was time to take control of the situation. Theoretically, rhubarb should be back in season within a month, so it would be silly to hang on to the bag I froze last spring. Digging deeper, I discovered there were several bags of forgotten raspberries, as well. Let’s put this frozen fruit to work and make a loaf of quick bread. I love quick breads. Who doesn’t? There’s easy. Forgiving. You don’t have to break out the stand mixer. Deliciously moist. Hold up well for a few days. I baked this loaf on Friday and I’m still, happily, eating it on Tuesday as I write this. But, enough of my jibber-jabber. This is supposed to be quick bread. Let’s get it done. Quick bread essentials: flour, butter, sugar, eggs, salt, and soda. We’ll make it something special with rhubarb, raspberries, and sour cream. Combine the dry ingredients. Let the rhubarb cook down until it collapses into a thick sauce. It won’t look very pretty, but we don’t judge cooked rhubarb on its looks. Melt the butter and mix it with the rhubarb, sour cream, and eggs. Quickly stir the wet ingredients into the dry. Fold in the raspberries. 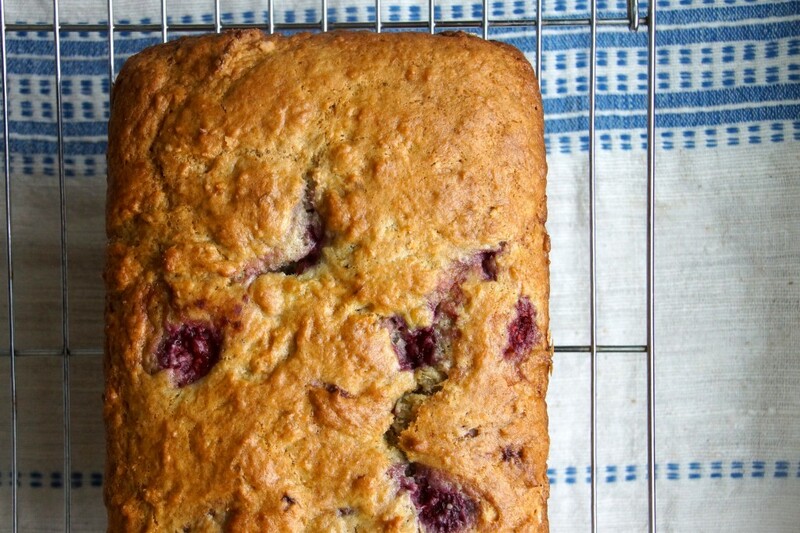 Scrap the thick batter into a loaf pan and you’re oven-ready. …or we could add a cream cheese glaze. As if I wouldn’t! Brew a cup of coffee and thank goodness we were bombed with frozen fruit. I love how versatile quick breads are. You could bake the batter into muffins or a coffeecake. You could add pecans or walnuts, substitute strawberries or blueberries for the raspberries. A handful of chocolate chips might be nice. 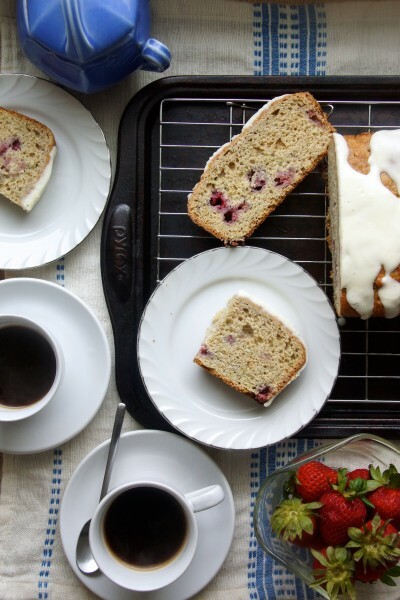 Skip the glaze and serve it with ice cream and fresh berries...the sky's the limit. Preheat oven to 350°. Butter and flour a loaf pan. Place chopped rhubarb in a small saucepan over medium heat and cook until it breaks down and becomes thick and sauce-like, about 5 minutes. Set aside. In a medium bowl, combine the cooked rhubarb with the melted butter, sour cream, and eggs. Quickly stir the wet ingredients into the dry, until just combined. Gently fold in the raspberries. Transfer the batter to the prepared loaf pan and bake until a tester inserted in the middle comes out clean, 55 minutes-1 hour. Cool on a rack for at least 30 minutes. After the bread has cooled, make the cream cheese glaze. Combine the cream cheese, powdered sugar, and pinch of salt and beat with an electric mixer until very smooth and creamy. Add milk until it reaches the desired consistency. 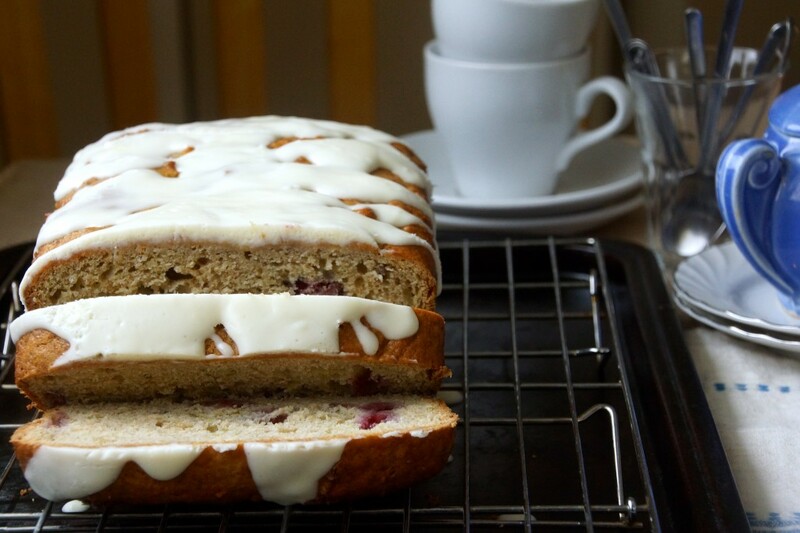 I prefer a thicker glaze--almost cream cheese frosting, but just liquid enough to pour over the bread. Wrapped and refrigerated, the bread will keep well for several days. This bread looks so delicious! 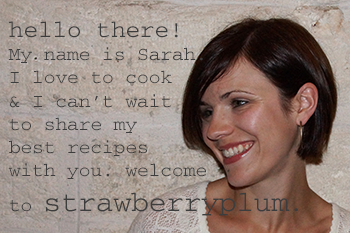 I love the combination idea of raspberry and rhubarb, can’t believe I haven’t tried it before, and for me cream cheese glaze always adds irresistible indulgence to bakes. Cream cheese frosting makes the world go round! 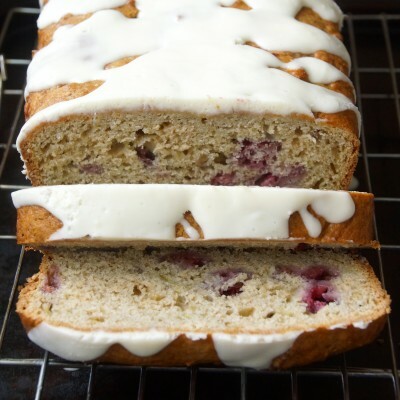 For the raspberry rhubarb quick bread–what size loaf pan do you bake it in? 9 X 5 X 3 ? Yes, 9x5x3. You could certainly divide it between 3 smaller loaf pans, if you prefer, or muffin tins and shorten the bake time. I made these as muffins and subbed frozen blueberries instead of raspberries and used plain yogurt instead of sour cream. They were moist and tasty…even without the frosting. My 4 year old nephew really enjoyed them! Thanks for the recipe. Making them again tonight to share.